Organized by non-profit Saffron Strand, Inc., the 7th Annual Homeless Workforce Conference, June 13-14, in Richmond, California, provides specialized training for those who work with the homeless and other vulnerable people. Both professionals and volunteers need to overcome compassion fatigue, vicarious trauma, and PTSD in order to better help their clients and lead their organizations to greater effectiveness in reducing homelessness and poverty. Every organization serving the homeless and other vulnerable populations faces the challenge of employee burnout or other dysfunction of front line workers. "If your organization serves vulnerable populations, like the homeless," says Matt Bennett, MBA, MA, "there's a high risk of employee burnout and other dysfunction, especially for frontline workers. But if you can create a culture of wellness, then employee health and resilience recovers and employees are better able to perform their duties." Bennett is chief innovation officer at the Coldspring Center for Health and Innovation in Denver, CO. He is a keynote speaker on “Creating a Culture of Wellness” at Saffron Strand’s 7th Annual Homeless Workforce Conference -- "Working with the Homeless: How to Survive & Thrive in the Trenches” -- June 13-14, 2016 at the Richmond Memorial Auditorium in Richmond, CA. Patricia Falotico, CEO of the Robert K. Greenleaf Center for Servant Leadership in Atlanta, GA also is a keynote speaker who focuses on "How Frontline Workers Can Become Effective and Inspiring Servant Leaders." 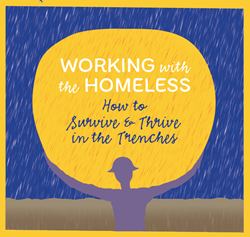 "Working with the Homeless" features other national and San Francisco Bay Area authorities to explore strategy, policy, and programming to ensure the wellness and performance of those who work with the homeless and other vulnerable populations. Helping at risk youth is especially traumatic. So the Conference has a special emphasis on supporting those who work with homeless, runaway, and foster care youth, helping them enter or re-enter the workforce. Other workshops explore innovative therapies to help "heal the healers" -- art therapy, music therapy, dance therapy, drum therapy, labyrinth therapy, and more.